Specialists and enthusiasts of eighteenth-century art and culture are in for a surprise at this exhibition. Agents of Faith celebrates votive objects, which the curator Ittai Weinryb defines as artifacts made or appropriated and then offered “as an act of faith, to make a pledge or fulfill a vow.” Organized in equally broad themes—such as memory, site, and the human body—the show includes a small number of eighteenth-century objects, very few of which will likely be familiar to readers of Journal18. Made far away from major European cities and often lacking precise attribution or dating, these objects may appear too crude to enter the annals of art and cultural history. It is precisely their unfamiliarity, however, that opens up avenues for rethinking the eighteenth century and its rich array of cultural productions. Fig. 1. Ex-voto of Josefa Peres Maldonado. Probably Aguascalientes, Mexico, 1777. Oil on canvas, 69.2 x 97.8 cm. Davis Museum at Wellesley College, Wellesley, MA, 2004.10. Throughout the exhibition, eighteenth-century ex-votos are juxtaposed with others to highlight the transhistorical and transcultural nature of votive objects. A section on “narrative and memory,” for example, opens with a 1777 ex-voto painting from colonial Mexico representing a woman named Josefa Peres Maldonado undergoing an operation to remove tumors from her left breast (Fig. 1). Painted to express her gratitude for its success, the picture is rife with references to a complex social structure and cultural ties to continental Europe, from the variegated skin tones of the depicted figures to the muscular rocaille framing of the inscription. On the other side of the gallery is an Italian ex-voto from 1925-1930, also portraying and giving thanks for an unidentified woman’s successful operation (Fig. 2). Whereas Doña Maldonado is surrounded by friars and family members as well as a surgeon, the Italian woman is closely attended by three physicians in white lab coats, while a nurse and two women keep a safe distance from the specialist procedure. Yet even in this modern setting with its institutionally reinforced gender division, the presence of the divine persists. Instead of an altar as in the earlier picture, a vision of a saint hovers near elevated drip chambers. The striking parallel between the two paintings demonstrates how belief in votive offerings cuts across centuries and cultures. Fig. 2. Votive painting of a woman’s successful operation. San Vincenzo alla Sanitá, Naples, Italy, 1925-1930. Watercolor, 34 x 43 cm. Rudolf Kriss collection, Bayerisches Nationalmuseum, Munich, Kr V 120. © Bayerisches Nationalmuseum Munich. Photograph: Walter Haberland. Similar juxtapositions are found in a third-floor gallery, which explores votives representing the human body and the materials used for such objects. German-speaking lands, especially Bavaria, feature prominently in this section. A small vitrine brings together wax ex-votos and their wooden molds from the seventeenth to nineteenth centuries. Their similar format—all full-length standing figures—suggests how different motives behind the act of offering would have individualized these highly replicable objects. Likewise, a nearby vitrine presents schematic depictions of human lungs in wax, clay, and wood. Presumably offered in the hopes of curing tuberculosis, they strike the viewer with the primacy of the votive power over medicine in rural parts of eighteenth- and nineteenth-century Bavaria. Fig. 3. Lungs votive. Germany, 18th-19th century. Wax, poured and drawn, 32.2 x 17.4 x 9 cm. Rudolf Kriss collection, Bayerisches Nationalmuseum, Munich, Kr Wv 1294. © Bayerisches Nationalmuseum Munich. Photograph: Walter Haberland. Many of these objects have broad timelines, which historians of the early modern and subsequent periods might find too difficult to allow for further, more nuanced engagement. One of the lungs votives in wax, for example, is dated sometime around the eighteenth or nineteenth centuries (Fig. 3). While the lack of a more precise date has much to do with the votive’s nature as a folk object—neither the maker nor the commissioner is known—it should also be noted that the object shares the same gallery with an Etruscan bust of a young man from the third to second century BCE (a rare loan from the Louvre). Curated by a medievalist, the exhibition places a resolute emphasis on the persistence of certain forms and associated practices across the longue durée, for which two centuries constitute a mere moment. Indeed, it is this persistence that I find most useful for specialists and enthusiasts of eighteenth-century art and culture. The lungs votive occupied the same time span as the development of anatomical models, which social elites and emergent medical institutions assembled into celebrated collections in and around Paris, London, Florence, Bologna, and Vienna. In contrast to such highly naturalistic, increasingly minute models, the schematized wax lungs have a closer visual affinity with medieval depictions of human organs. Decorated with a picture of the Virgin and child to beseech divine intervention, the eighteenth- to nineteenth-century votive recalls older modes of visualizing the human body and engaging with the resulting picture. Fig. 4. 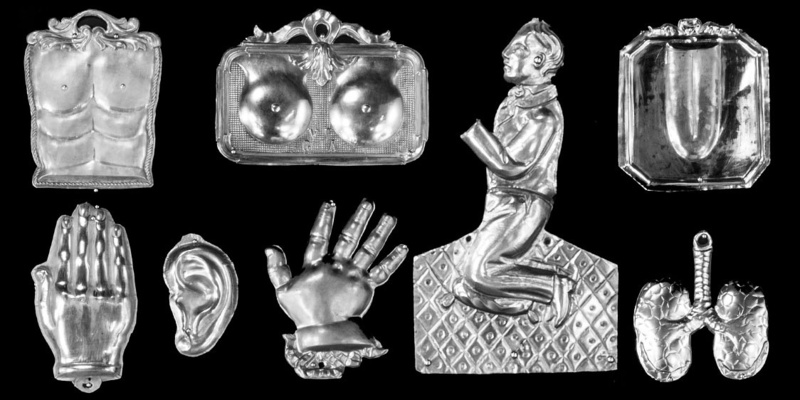 Man and woman votives. Germany, 1700-1850. Wax, Man: 22.2 x 9 x 6.8 cm; woman: 23.7 x 9.5 x 6.8 cm. Rudolf Kriss collection, Asbach Monastery, Bayerisches Nationalmuseum, Munich, Kr Wv 1050, 1057. © Bayerisches Nationalmuseum Munich. Photograph: Walter Haberland. A pair of standing wax figures likewise retain older forms (Fig. 4). Dated 1700-1850, they are wearing what are clearly seventeenth-century costumes, presumably because their molds were made in an earlier period. If the figures had been painted, some would readily call their costumes Van Dyckian or even venture to invoke the survival of seventeenth-century motifs in eighteenth-century painting and theater. My point here is not simply that, in the case of these molded figures, the efficacy of reproduction overruled historical or personal specificity. Rural Bavaria, where almost all of these figures come from, also saw a proliferation of highly ornate church interiors that are sometimes described as Rococo. It is striking that these objects in such outdated forms were activated and left inside up-to-date spaces, whose architectural and decorative components had urban origins. If we set aside issues of aesthetics and taste, we may even consider that the coexistence of different temporalities is perhaps parallel to the presence of ancient marbles and porphyries in urban elite interiors of the same period. If the goal of Agents of Faith is to emphasize the transhistorical and transcultural, these individual objects and their nearby juxtapositions offer an opportunity to rethink how we engage with eighteenth-century art and culture. As the historian David Edgerton has perceptively noted, innovation-centric biases have often prevented historians of science and technology from acknowledging persistences and failures and thereby from fully understanding the multivalent place of technology in history. While the specific terms in art and cultural history may differ, Edgerton’s assessment is a useful reminder that what remains not only coexists but often legitimizes what is novel. The crude eighteenth-century objects in this exhibition, with their outdated forms and even more ancient practices, alert us to the complexity of the culture that is sometimes all-too-easily associated with the Enlightenment. Just as we carefully attend to the impact of the eighteenth century upon subsequent time periods all the way up to the present, it seems productive to consider what the eighteenth century inherited as well as what lingered from preceding eras. Ittai Weinryb, “Of Votive Things,” Agents of Faith, ed. Weinryb (New York: Bard Graduate Center Gallery, 2018), xi. David Edgerton, “Innovation, Technology, or History: What is the Historiography of Technology About?,” Technology and Culture 51:3 (2010), 680-697. Cite this note as: Charles Kang, “Agents of Faith: A Response,” Journal18, (January 2019), http://www.journal18.org/3340.